The bedroom is an ideal place to work in peace. Whatever room you have, our Classic, Industrial & Loft, Romantic and Exotic etc. styles have been devised to meet your needs. 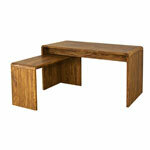 To work with ease, take home a desk with a wide top, with or without storage. For less clutter, try a wooden writing desk instead: its drawers and niches let you tidy everything away.